We all need them, don't we??? Well I know you think those "holiday gift giving times" are far off in the future...I mean, come on, Thanksgiving isn't even here yet, RIGHT?? Right, however, taking the time to start prepping cute little QUICK & EASY handmade gifts NOW will save you so much frustration later!! So as my final project as a guest designer for Really Reasonable Ribbon, I thought I would share with one of my "go to, quick & easy" gift ideas. : A Double Chocolate Mint Cocoa Gift Kit. As you can see the ingredients are simple and relatively inexpensive. Two packages of cocoa, a baggie filled with chocolate chips, and four starlight mints (or two candy canes but I didn't have any on hand yet - I refuse to buy them until November - atleast!!!!). So to begin you slip all of your kit ingredients into your clear bag. See how cute my mints look all lined up?? ***TIP: Use a bit of adhesive or a glue dot and STICK THEM TO THE COCOA PACKET!!!! :) Keeps 'em looking all cute and in a line!!! Once you have placed all your kit ingredients into your bag you seal it up and make a paper topper. 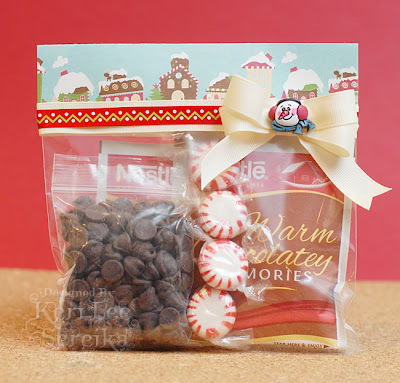 To do that simply cut a piece of cute paper 3" x the width plus 1/4" of your clear bag. So my bag was 6 1/4" wide, I cut my paper 3" x 6 1/2". Fold it in half and staple it over the top of the clear bag. Next the fun part - EMBELLISHING!!! As you can see, I have used two different types of ribbon here. I first wrapped a length of Ivory Grosgrain around the bottom edge of the paper topper and glued it in place. 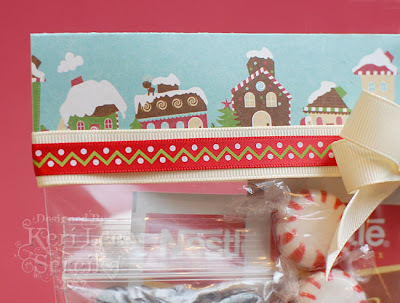 I then layered on a cute red printed ribbon from October's Monthly Ribbon Club Pack and then glued it in place. And then I tied my bow using the Ivory Grosgrain again with the help of the hand dandy Bow Easy Tool. 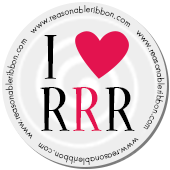 I have really enjoyed my time designing for Really Reasonable Ribbon and I hope you have enjoyed the array of different projects I have brought you this month. Remember, it's always better with a bit of ribbon!!! What a wonderful holiday gift idea Keri! We all need to have a stash of quick and easy gift ideas in the back of our heads. The holidays will be here before you know it. Thanks so much for guest designing for us for the month of October. It was a pleasure to have you!! What a fun little gift idea. You've decorated it beautifully. 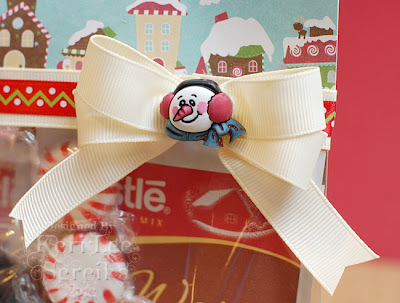 The pkg is so cute but for me the best is that adorable snow man button on the bow. Awesome presentation. These treat bags are darling! Thank you so much for being our Guest Designer this month! I love your work~!